The site occupies a prominent position immediately to the east of Carmunnock Road (B766) at its junction with Glenacre Street, close to the centre of Castlemilk, which is located approximately 4 miles south of Glasgow City Centre. Carmunnock Road forms one of the arterial routes passing through Castlemilk, and via Aitkenhead Road (A728), provides direct links to the city centre. The site is triangular in shape and is bounded by Glenacre Street, Glenacre Terrace and Carmunnock Road. The site is only a few minute’s walk from the local neighbourhood shops within Castlemilk whilst the Braes Shopping Centre is also closeby. The site also benefits from good public transport connections with local bus routes running along Carmunnock Road as well as neighbouring streets. Kings Park train station lies to the north of the site and is within a short walk. The surrounding properties are generally residential, however the area also benefits from excellent local amenities which include Cathkin Braes Country Park and golf club, King’s Park and Linn Park, all of which are within walking distance. 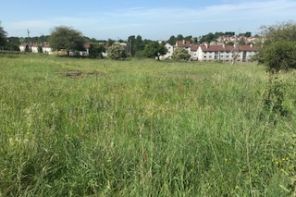 The site adjacent to the property is in the process of being redeveloped to form residential property, being developed by Glasgow Housing Association. Other properties in the immediate area are a mix of private and local authority style housing. The site forms a triangular shape and slopes downwards from south east to north west. The perimeter is secured by a metal fencing with mature deciduous trees featured along the Carmunnock Road and Glenacre Terrace boundaries. The remainder of the site is formed of grass and shrubbery. The former church is located to the southern end of the site; this comprises an art deco structure which is formed over two main levels, and includes main church, lesser halls, vestry, office, kitchen and toilet facilities, as well as cellar. The building is in a poor state of repair, and although it could be utilized, significant upgrading works are anticipated to both the exterior fabric and internal decoration.